Herstory examines gender and cultural identity through a motion activated sculpture, featuring a miniaturized and somewhat distorted replica of the artist. When activated her head and arms start moving as if trying to reach out, her heart starts pulsating, and she attempts to speak. 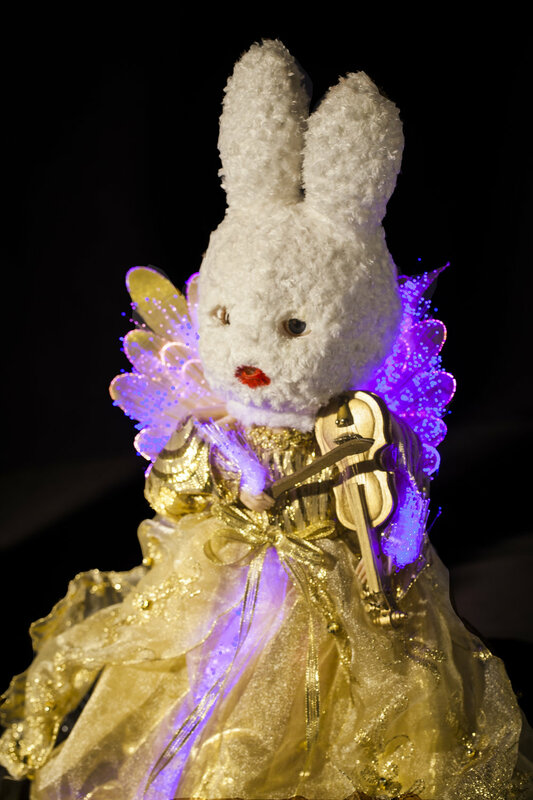 Her trusty companion, a fiddler bunny in a golden dress plays original music by Yevgeniy Sharlat. The piece embodies humor, compassion, and silent sorrow of those who are hurting, yet are unable to speak up. The piece embodies humor, compassion, and silent sorrow of those who are hurting, yet are unable to speak up. It echoes my personal experience surviving sexual violence as an under aged, illegal immigrant in the US, unable to ask for help. 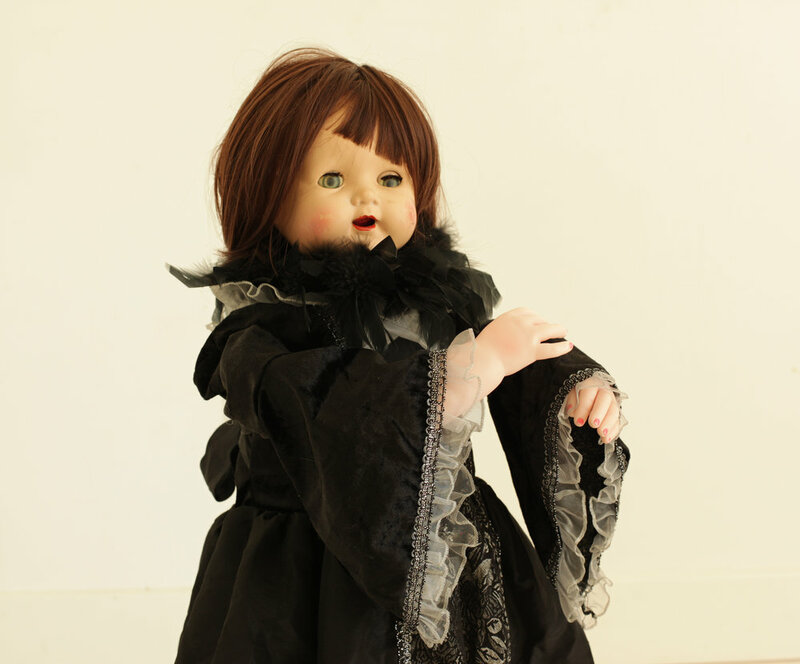 Herstory has a companion animatronic child-doll which makes comments about the human-robot relationship. The piece is constructed from a variety of hacked dolls. 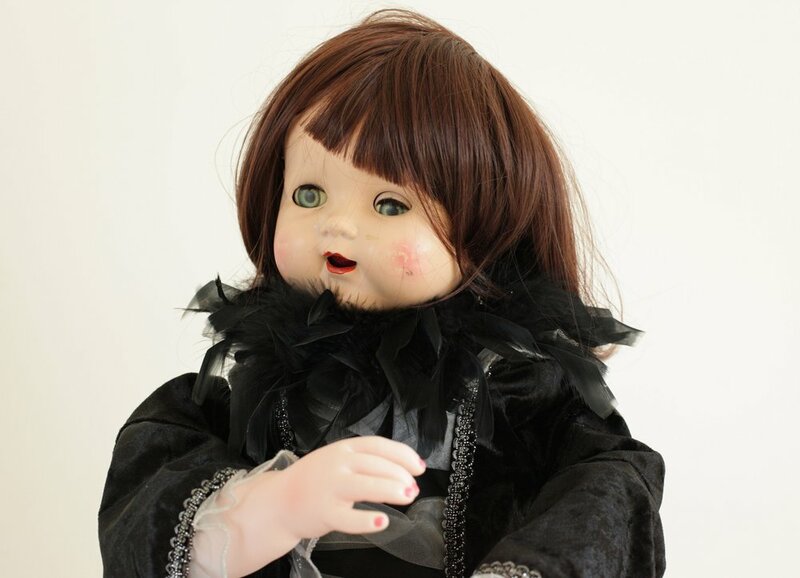 The Arduino open source for the doll code is available here. The piece has four main electronic components: an Arduino computer, an MP3 player, a distance sensor and a bank of relays. The MP3 player is a small electronic component that can play MP3 files from a micro sd card and is controlled through the Arduino. A 3-watt amplifier drives two small speakers to produce sound. The head and hands of Herstory are 3D printed. Made with the support of The Foundry at The University of Texas at Austin. Technical development by Theodore Johnson. The piece was exhibited at SXSW Interactive 2018. The exhibition was sponsored by SXSW and the City of Austin Cultural Arts Division and was a part of the UNESCO Media Arts Exhibition at SXSW. Photography by Lana Bernberg and Scott David Gordon.